A European Union official visiting Baku on June 16, 2017, should press President Ilham Aliyev to free unjustly imprisoned political activists, journalists, and other government critics, Human Rights Watch and the International Partnership for Human Rights said today. 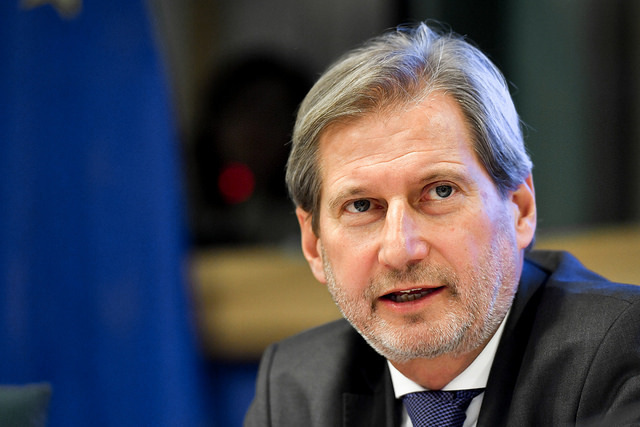 The commissioner for European neighborhood policy and enlargement, Johannes Hahn, should also urge Aliyev to lift restrictions on activists released from prison and reform laws that severely curtail fundamental freedoms. Commissioner Hahn will be in Baku on an official visit as part of preparations for the Eastern Partnership Summit, scheduled for November, and is set to meet President Aliyev, and other top officials, as well as nongovernmental groups. The EU opened negotiations for a new partnership agreement with Azerbaijan in February 2017. The visit comes a day after the European Parliament adopted a resolution condemning Azerbaijani authorities’ arrest of a journalist who had been kidnapped in Georgia and taken illegally to Azerbaijan, and calling for the release of activists arrested on politically motivated grounds. In recent years, the Azerbaijan government has severely restricted independent activism, critical journalism, and opposition political activity by imprisoning and harassing many activists, prominent human rights defenders, and journalists. Draconian laws and regulations impede the operation of independent groups and their ability to secure funding. In an urgent resolution adopted on June 15, the European Parliament condemned the abduction of the journalist, Afgan Mukhtarli, in Tbilisi and his subsequent arrest in Baku, and urged the Georgian authorities to promptly and effectively investigate the case. The European Parliament also called on Azerbaijan to release Mukhtarli and others detained on politically motivated grounds, including political analyst, Ilgar Mammadov; another journalist, Mehman Huseynov; and youth activist, Ilkin Rustamzadeh. Since November 2015, following significant international pressure, the Azerbaijani authorities have released 21 human rights defenders, journalists, and political activists who had been imprisoned on politically motivated criminal charges. But the authorities continued to arrest and prosecute dozens of others on spurious criminal charges to prevent them from carrying out their legitimate work. The crackdown has intensified in recent months, Human Rights Watch said. Azerbaijan authorities arrested Mukhtarli, the journalist and political activist, on May 30. He was apparently kidnapped the day before in neighboring Georgia, where he was living in exile, and illegally taken across the border. He is facing criminal charges of illegal border crossing, smuggling, and resisting authority. Also in May, authorities arrested two more journalists, Aziz Orujov and Nijat Amiraslanov, as well as a high-level official of the opposition Popular Front Party of Azerbaijan, Gozel Bayramli, on spurious administrative and criminal charges ranging from resisting police to illegal entrepreneurship and smuggling. In March, a Baku court sentenced Huseynov, the journalist and blogger known for exposing alleged government corruption, to two years in prison on bogus defamation charges because he complained about police ill-treatment. More than a dozen activists convicted in politically motivated trials between 2013 and 2015 remain in prison. Among them is Mammadov, leader of the pro-democracy opposition movement Republican Alternative (REAL). The Council of Europe’s Committee of Ministers has repeatedly called for his release, in line with a May 2014 European Court of Human Rights decision finding that Mammadov’s imprisonment was in retaliation for his criticism of the government. None of the convictions of those released in the past two years were quashed and some face travel restrictions, including the award-winning investigative journalist Khadija Ismayilova and the human rights lawyer Intigam Aliyev. Others have fled the country fearing further politically motivated prosecutions. Nongovernmental organizations in Azerbaijan face almost insurmountable bureaucratic hurdles to operating independently due to excessive legal and regulatory restrictions. In March 2017, in response to the crackdown on civil society, the Extractive Industries Transparency Initiative (EITI), a prominent international multi-stakeholder group that encourages better governance of resource-rich countries, suspended Azerbaijan’s membership over the government’s failure to adequately loosen these restrictions. Since February, the EU and Azerbaijan have been negotiating a new partnership agreement to enhance political and economic ties between them. The new agreement will replace the 1999 Partnership and Cooperation Agreement, which guided their bilateral relations in political dialogue, trade, investment, and economic, legislative, and cultural cooperation.